Just a quick reminder for those who live in or near NYC today is an afternoon long festival of food on fun that runs along Orchard St from Delancey to Houston. For more details check out here . After Pickle day I have a gay wedding to go to but will post pictures tomorrow. 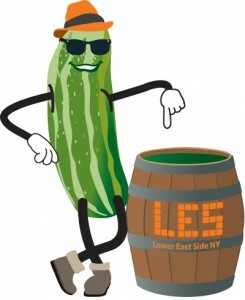 This entry was posted in NYC, Other Stuff and tagged Lower East Side, Pickle Day. Bookmark the permalink. I love there is a Pickle Day on Delancey. I’d have put on a big brown hat and totally gone there. If I could.